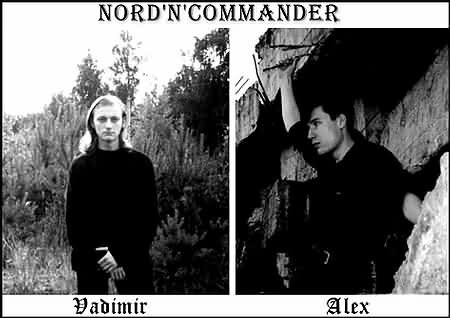 The band NORD'N'COMMANDER came into this world in 2001 as a clear-cut realization of Will and Reason on the path to true Self. NORD'N'COMMANDER doesn't confine itself to any one style. The sphere of the musicians' interests is between radical forms of industrial, saturated with archaic folk melodizing, and symbolic play with such styles as gothic and darkwave. On the side of lyrics NORD'N'COMMANDER is interpretation of Indo-European philosophical and mystical doctrines in the light of a concrete person who attempts to counteract metastases of "consumer society". Ancient Archetypes, i.e. Creativity, break through "civilization of asphalt". The Creativity realizes itself where awaked Mind acts out of itself. And only that one creates who is among things but not devoured by them. Creativity is the centre where a human being becomes identical with Oneself. Creativity is the command of Detachment, on the periphery of which self-irony is pulsating.